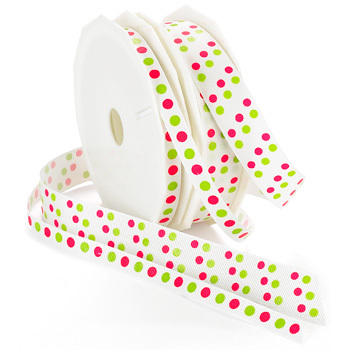 Dazzle Dot ribbon is printed grosgrain with glittered dots. Not only is this style adorable, the colors correspond with our Dazzle ribbon ( Style #990 ). Combined with or even by itself, this ribbon is perfect for making gorgeous hair bows. This style is available in 2 widths and 9 different color combinations. * Actual color may vary from the photo. We do our best to match the color swatches to the actual product color; however different monitors, different die lots, lighting, and other conditions prevent us from guaranteeing exact matches.